Whenever there’s a sudden downpour, there’s a risk that your basement could experience a sewer backup problem. It’s bad enough if clean rainwater backs up in your basement, but try to imagine dirty sewage filling your basement, ruining everything it touches. Fortunately, you can help prevent this by installing a backwater valve. A backwater valve (sometimes called a backflow or sewer backup valve) is a valve you can install on your sewer line and is designed to allow water or sewage to flow only one way, that is, out of your house. Anytime there is a sudden heavy rainfall, the city sewer lines can become overwhelmed, causing water or sewage to flow back towards your home. If there is a sewer system backup, and you have a backwater valve in place, sewage will not be able to flow back into your house. Backwater valves are required by some municipalities and recommended by others. They can be installed in the initial new construction or can be retrofitted into existing homes. Installing during the initial construction is naturally much cheaper, and can be installed for between $150 to $250. When retrofitting, some concrete will need to be removed to access the main sewer line. The cost to retrofit a backwater valve can range from $1,000 to $2,000. There are subsidies available in some municipalities to assist with the installation of backwater valves. See the links at the end of this article. The risk of sewer backup increases if there is a basement in your home, or if the ground floor is less than a foot above street level. If a new home has any fixtures located lower than the street level, it is a requirement of The National Plumbing Code to have a backwater valve installed. Your home’s sewer system allows water and sewage to flow out of the house. 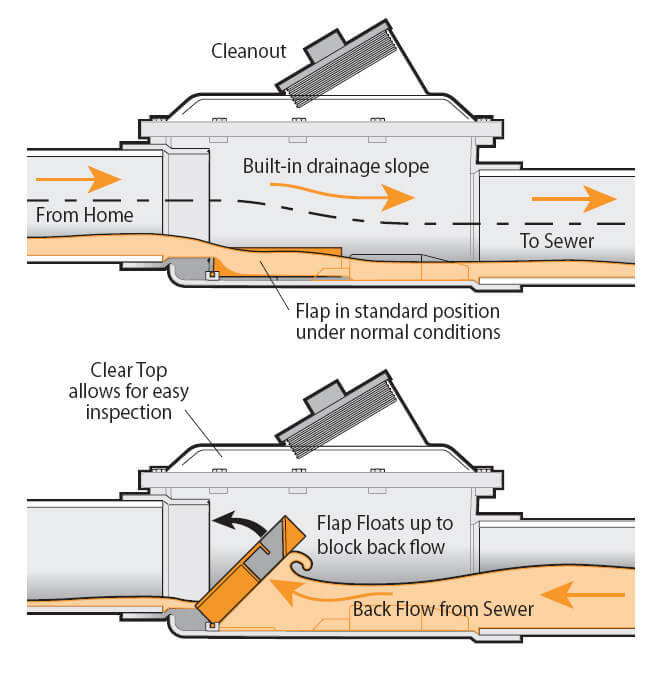 A backwater valve will stop water or sewage from flowing into your house should the main sewer line become overloaded. In most cases, you can check to see if it’s working properly by looking through the clear cover on the backwater valve access box. Inside the valve is a small flap that is normally open allowing water to exit your home. It also allows any sewer gases to be vented. There is a small floatation device on each side of the flap. If water or sewage starts to flow back into the house, these floaters cause the flap to lift up and close, thus preventing anything from entering your home. When the water stops coming back towards the house, gravity will allow the flap to fall into the open position again, allowing water and sewage to resume flowing out of the house. If this backwater valve is being put in an existing home, as opposed to being installed in the initial construction, a plumbing permit from your municipality is needed. A licensed, qualified plumber will have to cut a hole in the concrete floor, usually near the floor drain. They will dig down to the main sewer line, cut out a portion, and replace it with the new valve. These valves often have a clear top so you can see if it is operating properly. There is a lid that can be removed for cleaning. Without a properly placed and installed backwater valve, sewage could come into the basement through a floor drain, sinks, tubs, and toilets. Talk to your municipal government to find out if any local permits are required, as well as to find out what sort of equipment they recommend. Check that your drain and downspouts are not connected to the weeping tile and sanitary sewer. In most cases, if you disconnect the foundation drain, your home will require the installation of a sump pit and pump. It is recommended to talk to a plumber and your local government department for advice on how to properly disconnect downspouts and foundation drains. Hire a licensed plumber. They can install the backwater valve and can also obtain any necessary building permits. Municipal governments sometimes have lists of pre-approved plumbers. Make sure eavestroughs, once disconnected from the sewer system, drain away from your home, but not directly toward your neighbor’s property. Take a look at this great video by the Insurance Bureau of Canada on how a backwater valve is installed, and how it works. If you have a properly positioned and installed backwater valve, you shouldn’t experience much in the way of problems, as long as you have been maintaining it properly. Things can get stuck, preventing the valve from closing, or the valve can get damaged by sharp items. Proper, regular maintenance can catch these issues before there is a serious problem. Backwater valves are usually easily accessible, and with a clear top, you should be able to see if water is flowing freely or if anything is stuck. There are a wealth of instructional videos to help you “do it yourself,” or you can call an expert if the thought of sticking your hand in a sewage pipe is not particularly appealing. If you do attempt to clear a block on your own, be sure to follow ALL the instructions carefully, especially wearing gloves. If everything is clear, and the city sewer backs up during a major rainstorm, your backwater valve will close, which is exactly what you want to happen. But when that valve is closed, water cannot flow out of your house either. There is a certain amount of storage space in your plumbing system to account for this, but you may not want to shower and run your washing machine or dishwasher all at once during a major rain storm, or an extreme period of melting snow. Since none of this water will be able to escape once the backwater valve is closed, you could wind up flooding your own house. What can you do to maintain your backwater valve? You should check at least annually to remove any debris that could clog the valve and to make sure all moving parts have free movement. Most valves have an easily removed cover, to allow quick cleaning. But be careful. Some experts recommend running some hot soapy water down your sink first to make sure the system is fairly clean. Always wear rubber gloves and use a long handled brush to scrub around and under the flap. Most backwater valves will have manufacturer’s recommendations regarding maintenance. You’ll also want to look at the O-ring around the lid to make sure it’s in good condition. If not, it should be replaced to ensure a proper seal. Also, check the floats at each side of the flap, and replace if necessary. If these are worn, they will lose their ability to float, and won’t be able to lift the flap when needed. To keep everything flowing smoothly, you may want to consider NOT flushing such things as “flushable wipes” or diaper liners. By disposing of these things in the garbage, rather than in the toilet, you will be saving your system from performing extra work, and will hopefully be preventing the system from getting clogged. If you’re unsure about the condition of the valve, or are not comfortable attempting it yourself, you can call a plumber to do an inspection. Your backwater valve should last many years with the proper maintenance. Follow the manufacturer’s recommendations, and at a minimum, have the valve checked and cleaned once a year. And as mentioned above, keeping your system free of unnecessary materials, will also help to extend the life expectancy. Your home insurance provider may want to know if there is a backwater valve installed in your home, especially if your home is located in an area with a high risk of sewer backup. Wondering how to tell if you have a backwater valve installed? Often, the easiest way to tell is to check your home inspection report. This could have an effect on the rate charged for your home insurance or even whether or not you’ll be able to obtain insurance. Some home insurance providers may require you to have one installed to be covered for any damage caused by or related to sewer backup. Keeping your home dry and safe is important to you and your insurance provider. The cost incurred to install a backwater valve may be a lot less than the cost (and the headache) involved in repairing the damage to your home and valuable possessions caused by a sewer back up. Are there any municipal or provincial subsidies for backwater valves? In some areas, homeowners can obtain subsidies to assist them with installing backwater valves. We’ve listed some links below. If your area is not listed, check with your municipality.